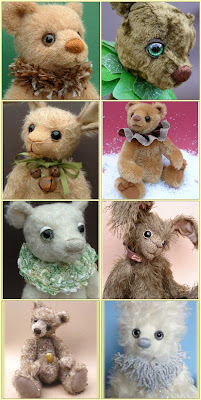 I'm now offering all the bears (and rabbits!) you see above with FREE postage and packaging, to ANYWHERE in the world! I've yet to update my website, so ignore the postage costs there! Pop along to my website http://www.sarahsbruins.co.uk/ to see them in more detail. You can also click on the image above to see it much bigger. I hope 2010 is treating you all kindly. A Sugar Dusted Happy New Year! Happy New Year everyone! May you be healthy and happy hearted. My decorations will come down maybe tomorrow. I feel heavy hearted about it, as I so miss the twinkly cosiness of it all at Christmas. Rooms always look so bare. I buy new decorations each year to add our tree, it's a slight addiction I think! I left the red off this year as we finished decorating the room Christmas Eve (!) and I felt just the gold would suit the room better. These were my new additions to our tree. They are meant for light fittings and are made of cut glass. They create rainbows on the walls when the sun catches them. Truly beautiful. I shall have to wait a whole year to see then again. Sigh. On the bear front I'm planning to make some minis! Something I can sit and do in the evenings. I've a couple of ideas bouncing around in my head at the moment. For a while now I've been wanting to re-do my website. I shall have to put my thinking cap on for that one. Anyway, once again, HAPPY NEW YEAR!